by EUGENE GRANT who interviewed the Zeppelin crew. 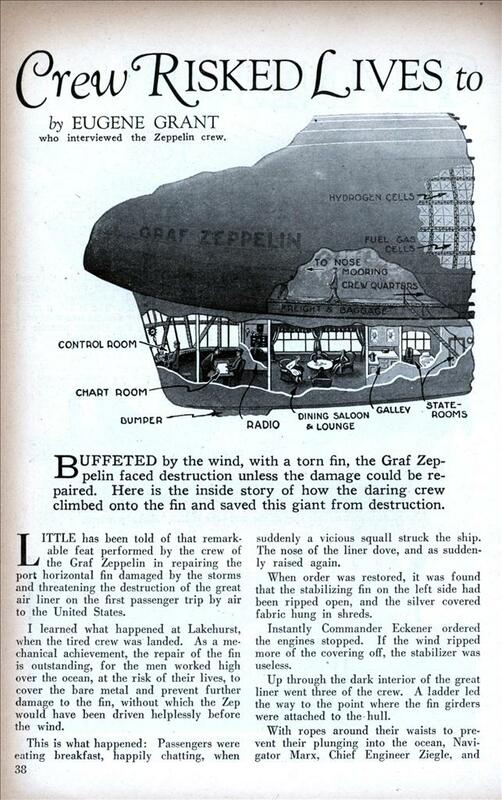 BUFFETED by the wind, with a torn fin, the Graf Zeppelin faced destruction unless the damage could be repaired. Here is the inside story of how the daring crew climbed onto the fin and saved this giant from destruction. LITTLE has been told of that remarkable feat performed by the crew of the Graf Zeppelin in repairing the port horizontal fin damaged by the storms and threatening the destruction of the great air liner on the first passenger trip by air to the United States. I learned what happened at Lakehurst, when the tired crew was landed. As a mechanical achievement, the repair of the fin is outstanding, for the men worked high over the ocean, at the risk of their lives, to cover the bare metal and prevent further damage to the fin, without which the Zep would have been driven helplessly before the wind. This is what happened: Passengers were eating breakfast, happily chatting, when suddenly a vicious squall struck the ship. The nose of the liner dove, and as suddenly raised again. When order was restored, it was found that the stabilizing fin on the left side had been ripped open, and the silver covered fabric hung in shreds. Instantly Commander Eckener ordered the engines stopped. If the wind ripped more of the covering off, the stabilizer was useless. Up through the dark interior of the great liner went three of the crew. A ladder led the way to the point where the fin girders were attached to the hull. With ropes around their waists to prevent their plunging into the ocean, Navigator Marx, Chief Engineer Ziegle, and Showing the general construction of the Graf Zeppelin (not in proportion) and the fin where the crew risked death to make repairs in mid air. The stabilizer, vital to the control of the liner, was almost stripped of its fabric during a storm. Knute Eckener, the son of the Commodore of the ship, began their hazardous work. Cords were passed to them, and they first bound the flapping fabric to the girders. The job seemed hopeless. At a word from the Commodore, the radio operator began sending the distress signals. If the fin gave way all might soon be plunged into the sea. It was a trying moment. Another squall was coming up. They must start the engines again and get out of its path or suffer certain destruction. Commodore Eckener’s son was out there on the fin—would the speed of the ship and the force of the wind blow him off—and his fellows? The Commodore could not hesitate. He gave the order to go forward with two of the motors. No warning could he given the crew on the fin. The ship surged out of the storm, and the men worked on, wet, cold, clinging to their ropes, but making headway with the job. For three hours they wove the fabric together, patched on new pieces, and fought to keep the fin together. The call for help was cancelled. All night they stood by, ready to go out onto the stabilizer again if the wind should again tear off the fabric. When morning came the goal was in sight—they had won! The most epochal voyage in history had been made. High above the stormy waters of the ocean the greatest airship ever built rode magnificently forward to — America, at seventy miles an hour. The accident was not as bad as it might have been. The squall which struck the Graf Zeppelin is the same type of quickly rising gust which wrecked the dirigible Shenandoah one dark night in 1924 as that daughter of the stars was over Ohio enroute to the Northwest. The squall which foundered the Shenandoah broke the airship in two and killed several members of the crew when the ship crashed in an Ohio cornfield. The Graf proved that her hull was strong enough to survive such “twisters.” The worst that happened was the ripping off of the cover on the fin, which, serious as it was, could easily have imposed strains which would have buckled a main longeron. Here again Eckener’s genius manifests itself. Had a girder buckled, it was so designed that the distorted members could have been removed. The new straight pieces would have been bolted into place, and the damage repaired right in the air as was the repair to the fin! What a marvel of forethought the Graf’s design is! The king of the sky followed a path over the seas traversed by that earlier group of adventurers under Christopher Columbus. 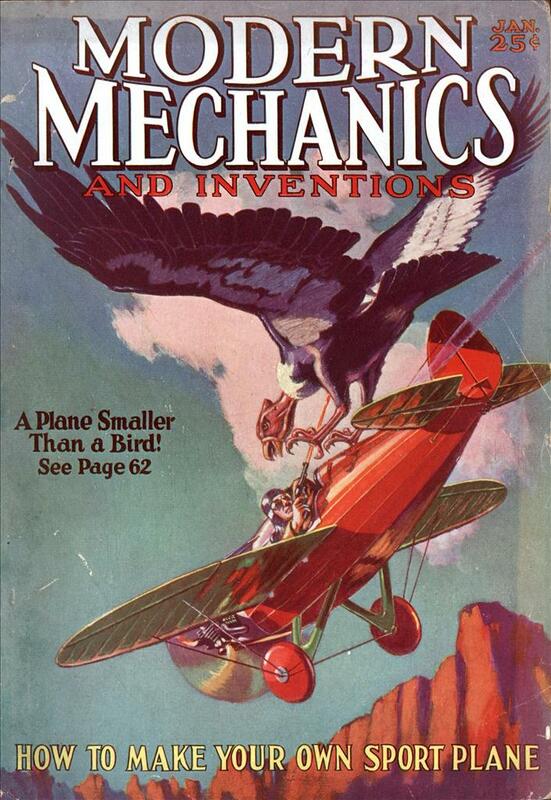 The air journey is equally hazardous and daring. It also became an epochal Transatlantic Crossing. But this modern Columbus, the Graf Zeppelin, is not manned by a crew afraid of dragons, of sailing to the end of the world—to the unknown. @ Tim, and here I just thought the guy was waxing poetic. Just watched this doc http://www.bbc.co.uk/pr… that describes the first flight around the world by zeppelin. It’s still available online, with an UK IP only though.